Author(s): Garima Pandey, Namisha Sharma, Pranav Pankaj Sahu, Manoj Prasad. National Institute of Plant Genome Research, Aruna Asaf Ali Marg, New Delhi-110067, India. Plants are continuously exposed to various abiotic and biotic factors limiting their growth and reproduction. In response, they need various sophisticated ways to adapt to adverse environmental conditions without compromising their proper development, reproductive success and eventually survival. This requires an intricate network to regulate gene expression at transcriptional and post-transcriptional levels, including epigenetic switches. 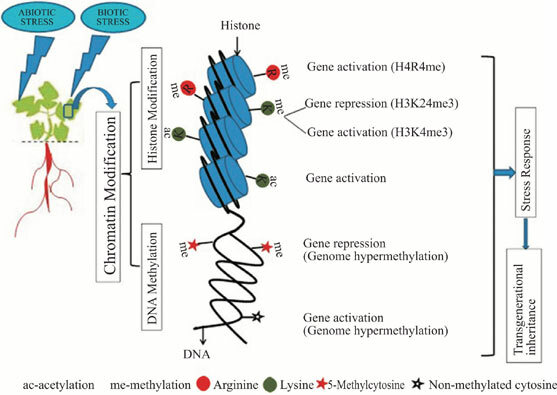 Changes in chromatin modifications such as DNA and histone methylation have been observed in plants upon exposure to several abiotic stresses. In the present review, we highlight the changes of DNA methylation in diverse plants in response to several abiotic stresses such as salinity, drought, cold and heat. We also discuss the progresses made in understanding how these DNA methylation changes might contribute to the abiotic stress tolerance. Keywords: Abiotic stresses, DNA methylation, Epigenetic, Histone methylation, Plant adaption. Affiliation:National Institute of Plant Genome Research, Aruna Asaf Ali Marg, New Delhi-110067, India. Keywords:Abiotic stresses, DNA methylation, Epigenetic, Histone methylation, Plant adaption. Abstract:Plants are continuously exposed to various abiotic and biotic factors limiting their growth and reproduction. In response, they need various sophisticated ways to adapt to adverse environmental conditions without compromising their proper development, reproductive success and eventually survival. This requires an intricate network to regulate gene expression at transcriptional and post-transcriptional levels, including epigenetic switches. Changes in chromatin modifications such as DNA and histone methylation have been observed in plants upon exposure to several abiotic stresses. In the present review, we highlight the changes of DNA methylation in diverse plants in response to several abiotic stresses such as salinity, drought, cold and heat. We also discuss the progresses made in understanding how these DNA methylation changes might contribute to the abiotic stress tolerance.